Robert Windsor's father, Levi Windsor, arrived in Australian on board SS Chyebassa from England in 1886 and lived at St Helens near Mackay, Queensland. He and his first wife had a family of six children. After the death of his first wife, Levi Windsor married Mary Dunn and they raised another family of nine children, Robert Levi Windsor being the eldest. I'm as happy as a king. Than Bob the carter lad." When I got near the town, the townies used to sniff and shout, "Smell the gum leaves!" Then I decided to let them feel the real branches of someone from the bush. A while afterwards the butcher came to my home to deliver meat. I was standing by my mother and he inquired if I was her son. When she answered yes, the butcher said, "He fights like a thrashing machine!" I promptly disappeared and that was the last lot of fighting I did in town. In his youth at Mackay, Bob Windsor became a blacksmith. When war was declared in Australian on 5 August 1914, the most immediate threats lay to Australia's north in German New Guinea and on Thursday Island in the Torres Strait. The Australian Naval and Military Expeditionary Force was formed in Sydney to take down German wireless radio stations in the South Pacific. Among the young men from North Queensland who were called upon to help them was Bob Windsor of Mackay. They were transported via the North Queensland towns of Mackay, Townsville and Cairns on board a poorly equipped vessel SS Kanowna. "We landed at Thursday Island eleven o'clock Tuesday morning 11th. We had to turn to then and unload the boat, when we (had) done that we had to put up tents, and fourteen had to sleep in each tent the first night and we were crammed and had to go to bed in the dark. Half of us had no blankets. The water also was horrible." "On 16th August Sunday they wanted five hundred volunteers for New Guinea. Since they have gone we have had more room and have more to eat"
"This morning at 7am went to Rose Hill where I spent 24 hours thinking it was the last time I would be there and so it is. Heard today I was going home on the Suva and in charge of the boys and horses." Later in the year 1915, Bob Windsor enlisted on 29 September at Rockhampton to serve in the Australian Imperial Force. Robert was then 18 years 10 months old, a single man 5 feet 11 inches (180.3 cm) tall and weighing 11 stone 7 lbs (73.3kg). His next of kin was his dear mother who was still living at Sandy Creek, Mackay. Private Robert Windsor, regiment number 8854, embarked from Brisbane on board HMAT Wandilla A62 on 31 Januaruy 1916, part of reinforcements in the 2nd Light Hourse Field Ambulance Australian Medical Corps, bound for Egypt. At Ismailia early in May, he joined the 15th Field Ambulance Unit for further training in preparation for service on the Western Front in France and Belgium. From December 1916 until March 1917, Private Windsor was detached from his unit to serve in workshops with the 5th Division Engineers. He returned to carry out the dangerous duties of field ambulance officers and was wounded in action in France. For treatment after gassing, he was admitted to Beaufort War Hospital in Bristol, England and later fully recovered at the Australian Command Depot at Sutton Veny. Back in France in April 1918, Private Robert Windsor resumed duties with the 15th Field Ambulance based at the Australian General Base Depot at Le Havre. He was a strong man. One of his war stories told of a dead mule across a narrow path. Soldiers in file were walking round the carcass but when Private Windsor reached the mule he moved it off the path. After the armistice Robert Windsor was promoted to Lance Corporal and received the rank of Honorary Corporal during the early months of 1919 in London. 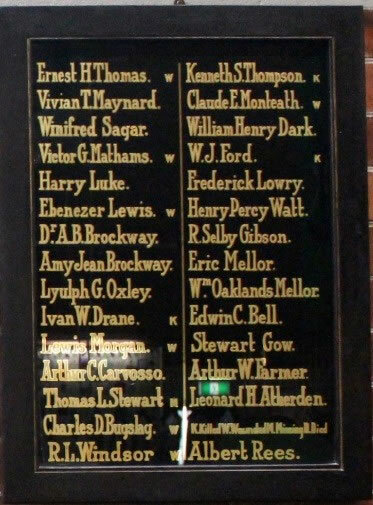 He was given non-military employment while engaged in farming at Great Missingham, Kings Lynn, Norfolk, before returning to Australia per HMAT Ceramic in October 1919. On returning to Brisbane, Robert Windsor commenced his working life by painting roofs then built up a successful engineering business located at first at Spring Hill and moving later to Fortitude Valley. He married Violet Irene Newman on 20 October 1920 and they had two children - a daughter, Joy and a son, Robert. They lived at Warrne Street and later Leichhardt Street, Spring Hill. R. L. Windsor's company commenced operation in 1926 in a small engineering shop concentrating on supplying knives and blacksmithing needs to industry. Mrs Windsor died in 1938 and Robert married Hazel Gladys Gordon on 12 April 1940. Their home was situated in St Paul's Terrace in the city and they attended City Congregational Church. When the Second World War broke out, Robert Windsor again volunteered for service. On May 1942 he enlisted at the age of 45 years 5 months in the Volunteer Defence Corps. The VDC was an Australian part-time volunteer military force, initially composed of ex-servicement who had served in World War 1. Robert Windsor was appointed to act as Sergeant and after course training at Redbank was released to work in his home area. Three daughters were born to Robert and Hazel Windsor. They were active members of City Congregational Church, Robert having been appointed a Deacon in 1926 and Sunday School Superintendent in 1927. After 25 years as a Deacon he was appointed a Life Deacon in 1952, an office he held for the rest of his life. A regular church goer, he was known for his firm handshake and a greeting, "This is a great day in the life of the church!" Mr and Mrs Windsor's home called Windsorville in Roghan Road, Bald Hills was a place of hospitality for their family and friends. In 1957 Robert Windsor entered politics, winning the seat of Fortitude Valley as a Liberal candidate on 3 August 1957. The electorate was abolished in 1959 and he was elected to represent the Ithaca Electoral District in the Legislative Assembly, a seat he held from 1960 to 1966. R. L. Windsor & Son Pty Ltd was a successful manufacturing and engineering company whose founder believed in an ethical, practical and innovative approach. The company was noted for designing and manufacturing equipment for sawmilling, packaging and plywood. The engineering workshops moved to Pinkenba then Clontarf. "We must establish a better feeling between employer and employee" he said. "We must have trust and respect of each other ... methods of the past based on economic combinations of force and fear must be supplanted by the better principles of faith and cooperation." "In everything you do put God first and He will direct your efforts with success." • Cairns Historical Society, Image No 04802, photograph of Kanowna. Thanks are expressed to Bob Windsor's daughter, Sandra, for her help with family details.